Former Head, Department of Microbiology, College of Medicine, University of Babylon, Hilla, Iraq. 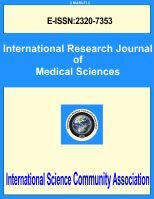 International Science Community Association are publishing an international peer reviewed journal International Research Journal of Medical Sciences . It is the vision of International Science Community Association to publish research papers, research articles, review papers, mini review, case study and short commutations in all areas of human study without financial restriction. Coverage Area: Researches in the field of Medical Sciences which including general medicine, social medicine, clinical medicine, sports medicine, transfusion medicine, oral preventive medicine and clinical research, clinical microbiology, clinical immunology, clinical pharmacology, clinical pathology, clinical cardiovascular research, clinical cancer research, clinical pharmacology, clinical nutritional research, clinical infectious diseases, bio-mechanics, biomedical engineering, public health and sciences, genetics, mental and metabolic disorders, psychiatry, pathology, toxicology, surgery, neurology, neurophysiology, dental surgery, oncology, orthopaedics, immunology, cardiology, embryology, anesthesia, diabetology, dermatology, gynaecology and ayurvedic treatment, etc.